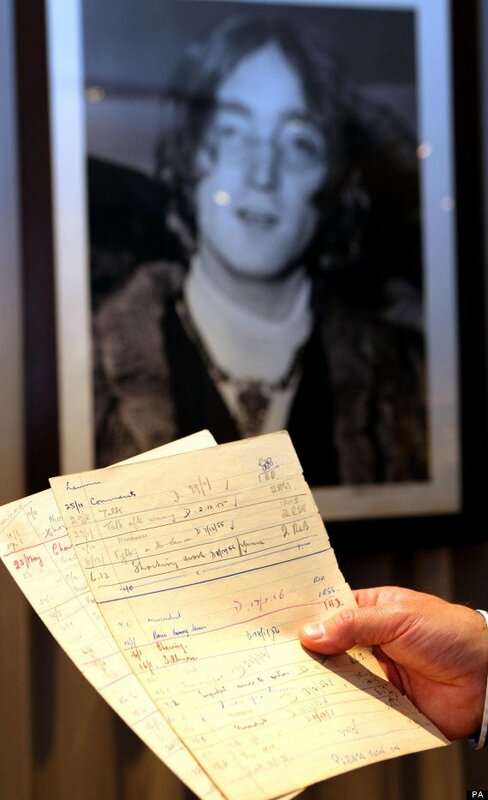 John Lennon’s school detention documents are being put up for sale. Teachers from Liverpool’s Quarry Bank High School for Boys wrote that 15-year-old John Lennon was punished for “fighting in class” and “sabotage”. The two documents from 1955 were rescued by a teacher in the 1970s who had been told to burn all of the books in a storage room at the school. The sheets are expected to be sold for up to £3,000 ($5,000) each at auction. The documents reveal that on two occasions John Lennon received three detentions in one day. Other reasons given by his teachers for punishment include “nuisance”, “shoving” and “just no interest whatsoever”. The documents cover the periods when he was in Class 3B between May 19 and June 23, 1955, and in Class 4C from November 25, 1955, to February 13, 1956. John Lennon went on to meet Paul McCartney in 1957 and together they formed the Beatles, who had their first hit in late 1962 with the song Love Me Do. The details of the young John Lennon’s detentions were discovered by an enterprising teacher in the late 1970s. He had been asked to clear out a storage room to make space for a newly-appointed teacher and had been instructed to burn all the books stored in the room. But spotting the name “Lennon” in the top of some of the pages he realized they related to the famous former student and tore the sheets from the book to retain as a keepsake. A number of the pages he had taken out of the book and kept were destroyed at a later date in an accident involving chemicals. Other sheets he gave away but these pages are some of the few that have survived. The sheets have been authenticated by John Lennon’s close school friend, Pete Shotton, who wrote a book John Lennon: In My Life. Peter Beech, who was John Lennon’s general science teacher at the time, said: “The sheet is typical of John Lennon, he was an extremely cheeky boy. “He did, however, know his limits. In the classroom, if you settled John down, you generally settled the class down. John Lennon died aged 40 after he was shot outside his New York apartment on December 8, 1980, by Mark Chapman. Online bidding for the detention sheets and other items of Beatles memorabilia starts at TrackAuction.com on November 22.